It's here! Or will be tomorrow. I always thought that seasons began on the 21st of the appropriate month, but here's Google saying Happy Spring to me today, the 20th. When did that change? A view from the deck, above. We he mowed the moss grass once and I began cleaning out the raised vegetable beds.There's a trailer of dirt to shovel in. Last week I sprayed the fruit trees with dormant oil. What a messy job that was. Forsythia in bloom tells me to get my rose clippers out. Clean, fresh air. Invigorating. Once I get out there I don't want to return indoors. Spring is here. It's not my favorite season. It's perhaps the most highly anticipated, but for sheer delight I'll take summer please, or perhaps early autumn. I like it warm and the temperatures rarely climb high enough for me on the west coast. Ranunculus like it cool. I like looking at them through the glass doors as I eat. A fat bead of water nestles next to the barest beginning of a tulip bulb, still hidden deep within the curl of leaves. Winter pansies are getting ready to bloom again. Seasons here fade and brighten slowly, imperceptibly. Winter putzes along, alternating rain and sun, with a few frosty mornings as a nod to the season. Spring pokes her nose in now and then while winter gives a few last paltry efforts and finally gives up trying. Spring throws a fit now and then, blowing hot and cold, frustrating gardeners, tourists and small children who want to throw off jackets and run barefoot through the sprinkler. Charming. Annoying. Capricious. That's spring. Primulas above on my mantel. I used a BeFunky edit to give them the watercolor look - not the Waterlogue App - don't know if I'm techy enough for that one. Welcome spring. I'm going to try enjoying you to the full this year, in spite of your moodiness. Spring is indeed welcome here. Forsythia is uncurling and a few branches are bringing my sitting room alive. Eh oui, le printemps n'est plus ce qu'il était... et c'est la saison où il y a beaucoup de travail. Cette année il était très en avance chez nous, mais c'était appréciable après l'année dernière où on ne l'avait presque pas vu. Les renoncules sont magnifiques, j'adore ces fleurs que je ne réussis jamais... et cette année j'ai mes tulipes en pot, on va voir comment elles vont évoluer. Interesting that you use the same indicator of the forsythia blooming as to when to prune the roses back. At least spring has arrived for you, it's going to be quite a few weeks before we'll see any blooms or blossoms. Thanks for sharing your flowers with me. I have good weather, but I am space challenged. Everything I have must go in a pot and I am good with that until we get a scorcher, then it gets stress and most times never recover. I with you on what day is Spring. I always thought it was the 21st, but apparently I am wrong. You have some colors and flowers!! we have had snow, sleet, and rain to day. A rather dreary day, but we are having friends in for pizza and going to watch a movie! Spring is around the corner here,,,,I am sure of it!! It could be that Spring became my favorite season while living in Southern California where it was just a little cooler than summer. Pretty flowers! I like Spring - to see all the growing things after a long, long cold white winter. My favorite is Autumn. Beautiful photos - I love Ranuculus! Spring is definitely moody especially here in the east. We had a good 12 cm. of wet snow followed by rain today. We'll get more snow too, and sun and cold and rain as it all leads up to real spring weather in May. Your pictures of the spring blooms in your garden are beautiful and hold a lot of promise of the season to come. Spring is definitely springing in your garden. The flower photos are all so pretty. The forsythia with the green grass in the background really caught my eye. Growing up where the winters were long I could hardly wait for Spring. Now I live where the summers are beastly and I can hardly wait for autumn. It looks beautifully green there and what wonderful blossoms. Spring isn't my favorite either, but late spring is my second favorite season. I do believe I love the capriciousness of spring. Your flowers are just lovely. 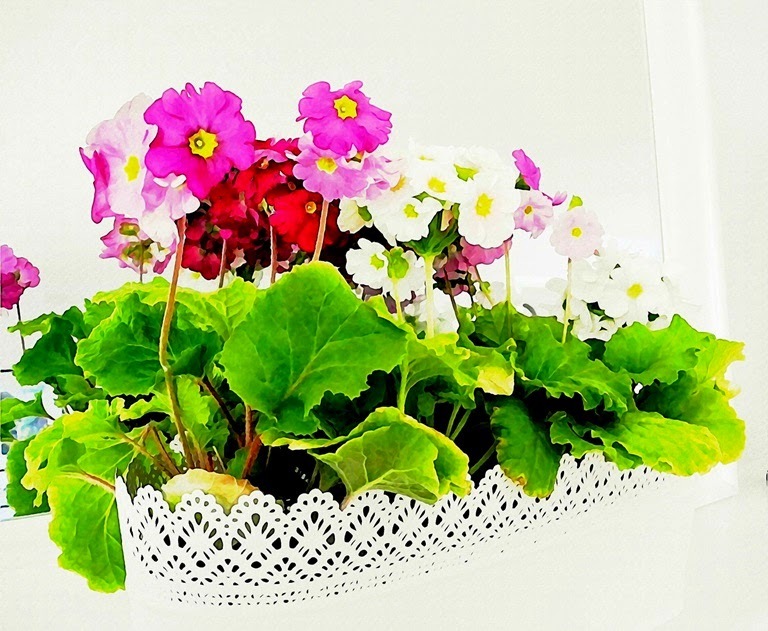 What a pretty planter of primulas on your mantel. back next year to visit me. Beautiful photos especially the last one. By the way you don't need to be techy to do the Waterlogue but you need an iPhone or pad. My 2 1/2 year old grandson was ably doing it on my phone today…it requires two clicks and that is it! He was so pleased with himself. Spring has been highly anticipate, as you say. Even more so this year after a particularly brutal winter here in the Mid-Atlantic, the coldest and grayest in recent memory! My own favorite season is autumn, followed by spring, then winter, then (lastly...can you believe it?!) summer. Summer is hot and humid here, although I am hoping that our colder-than-normal winter indicates a cooler-than-normal summer. Oh, how I hope! Ah Spring....now see I love it. Summer is okay but here it gets way to HOT for me so I enjoy the cooler temps of spring. Your Forsythia is lovely. I need to get out there with my rose trimmers too and also do some weeding. Hoping for that next week. Lovely flowers at the end. I know that BeFunky technic isn't quite the same as the Waterlogue app but it still looks pretty. Your spring is much father along than ours. Glorious colors. Spring is still my favorite season - despite its fickleness and I do adore summer when it comes along. I love your watercolored photo - it seems to be more realistically water color than the waterlogue one - I think I'll give it a try. Hopefully this will be a warmer spring than some - the forecasts say so - and then they change their mind. Spring is moody but I love it. Sooo exciting to get out after the dreariness! I can see why Spring is not your favorite season. I feel the same way but for a different reason. Our spring is long and steady. New flowers come out very day and birds are everywhere. I love spring, but my allergies are at their worst in the Spring. I am allergic to practically everything. The moment leaves start to appear, my allergies begin and won't go away until late spring - early summer. I'm with you Lorrie, Autumn is my favourite season. She arrives quietly as she magically turns leaves from green to faded yellows through to reds and browns. Temperatures are more conducive to a good night's sleep and at last a blanket can be added for comfort! Having said that, I'm envious of your flowering Forsythia and the jewel colours of the Ranunculas (notes are made in my garden note book to plant up some pots for a display later in the year)! Added to my list for today (Sunday) is a visit to the garden centre!! Primulas are always part of my front door display come Spring too! (Thank you for the tip Lorrie, after seeing everyone's Waterlogue images I've wanted to try something like it too - the Be Funky watercolour effect is perfect - I haven't got an ipad). Hey, thanks for the BeFunky tip. And for sharing your SoCal spring. Being a San Diego girl I always felt that spring in SoCal went way too fast. By late April it was usually summer full on for us.